In 2014 I attacked the problem of “Overlapping ranges with priorities”. This time I’ll deal with NULLs and propose an improved solution. Assume overlapping ranges with one attribute. I call the overlapping parts “segments”. Segments: break each range down into segments, including the range’s attribute. 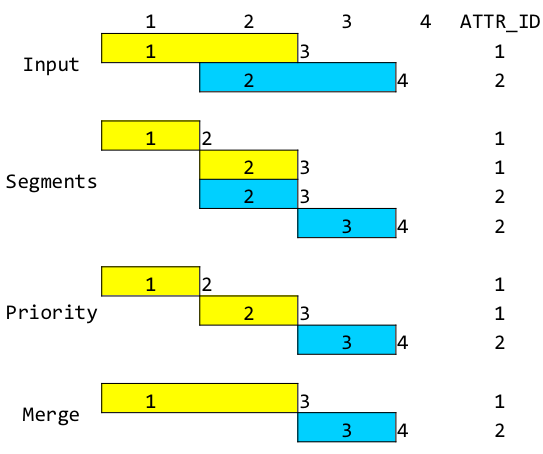 Priority: when two or more segments with the same “from” and “to” have different values, the minimum value has priority. Merge: once all the segments have proper values assigned, merge contiguous segments having the same values. OBJ_ID indicates the relation between the ranges: “overlaps, contains”. The 0 in position 6 means there are no nulls. So we can check our results more easily, each row contains the relationship between the ATTR_ID values. There are 6 such relationships, identified by the last digit of OBJ_ID. First I UNPIVOT F and T into one column called FT that contains all the boundary points, and I create a column called SEG_START that is -1 when the source is F and 1 with the source is T. I also retain the original value of T in every new row. Then I use MATCH_RECOGNIZE to identify, each time SEG_START = -1, all the boundary points up to and including the original T. I output each segment with the original ATTR_ID value. Finally, I use MATCH_RECOGNIZE again to merge the contiguous segments with the same ATTR_ID value. lines 15 and 17: include segments that end with NULL. Just so your mouse won’t get too tired from scrolling, I will spare you the output. There are 20 additional rows for the new test cases. lines 1 through 9: as explained in my previous post, I create a new column called NULL_ORDER so that NULL “from” values come first. lines 10 through 25: I combine segmenting and grouping in one SELECT just to show that it can be done: the MATCH_RECOGNIZE clause is executed before the GROUP BY. The NULL_ORDER column is used in ordering and comparisons. line 28: order by seg_f NULLS FIRST and it all works! Next up: Swiss Army knife.